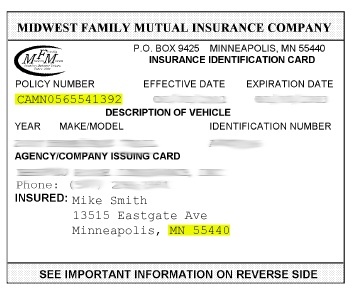 Please note: The state, policy number, and zip code that you use must match your documentation. Please see the following examples for assistance in locating this information. Please use the Policy mailing address for the State and Zip Code fields. An Artisans/Contractors Policy from Midwest Family provides broad coverage for your buildings and business personal property, coverage that is tailored to meet the specific needs of your business. When your business is insured by Midwest Family, you are free to do what you do best - run your company. In the event you need your insurance coverage to respond, you can be confident that you have one of the best policies available. Our Artisans/Contractors Policy covers you in the event of a loss to your property and provides liability protection in the event you are legally responsible for bodily injury or property damage arising from your business premises and operations. *When Business Personal Property Coverage is Written. Includes the following coverages for a single premium. Need Additional Security or Coverage from another Program? Great News! 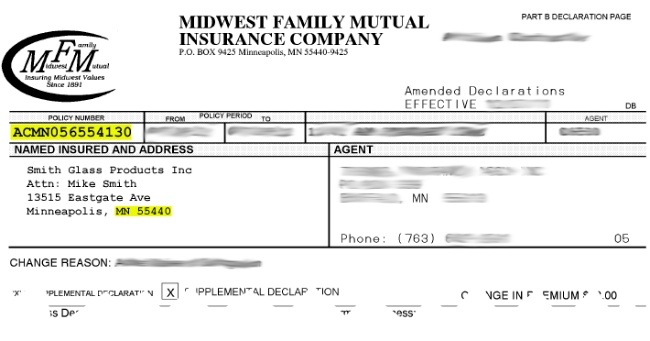 Midwest Family offers Umbrella Coverage with limits up to $10,000,000. Additionally we can package together multiple programs to suit your insurance needs. Our Direct Bill System gives you the option of paying the premium in full or choosing one of our convenient payment plans. If you have more than one Commercial Policy with Midwest Family, all policies will appear on a single bill. If changes are made during the policy term, the difference in premium will be spread over the remaining payments. Simple, easy to use and flexible, that's the Midwest Family way of doing business. Midwest Family markets its products exclusively through independent insurance agents. If you would like more information about our products please contact your local agent. Note: This information is for illustration purposes only. Please read your policy for specific details regarding coverage and limits. © 2001-2019 Midwest Family Mutual Insurance Company, West Des Moines, IA, U.S.A. All rights reserved. The products described on this Web site are not available in all states of the United States.